Leaves the warehouse within 1 business day. 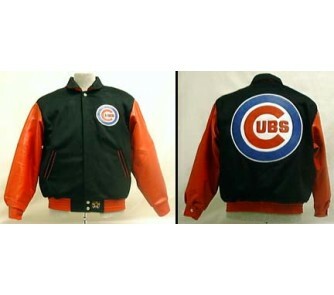 Enjoy this item featuring the MLB Chicago Cubs. The perfect gift for any Chicago Cubs fan! Cashmere Wool and Lambskin Leather Jacket: Has complete leather front and back logos made of lambskin. Lambskin leather sleeves, collar and waistband. Ever since their inception in 1988, J. H. Design Group has experienced continuous growth and success as well as special recognition throughout the world. Their unique creation, coupled with the very distinct J. H. Design look, has placed them at the forefront in the Sports Outerwear Industry. They continue to receive world wide acclaim among Pro-Athletes and Celebrities, and are extremely proud of their business relationship with several of the Fortune 500 Companies for their marketing needs in Premium and Incentive Programs. Strength and confidence is the foundation of J. H. Design Group. They have spared no effort in attaining unrivaled quality and craftsmanship in their collections. Their products are made with the finest imported Italian Lambskin leather. Their professional art work and unsurpassed finish make each of their jackets a “PRIZE POSSESSION, MADE IN U.S.A.”. They are committed to excellence in creativity and up-to-date fashion trends. Their constant interest is to focus on the complete satisfaction of their customers.Quanities are limited on closeout out items and are subject to availability. Shipping Details: This item ships standard for $10.95 to the Continental U.S.